I know, I know…another soup recipe! Apparently there is a theme to my cooking lately…an unplanned theme, but a good one nonetheless. 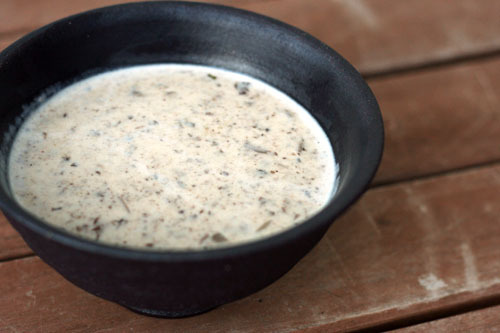 Tonight I made cream of mushroom soup. This is one of my favorite kinds of soup, and this recipe was perfect. Quick note, all of the soups I shared this week can easily be made vegetarian by substituting in vegetable broth. Anyway, I’m sure you want the recipe, so here goes! I found it on Simply Recipes…Elise is one of my blogging buddies whom I have had the pleasure of actually spending some time with. She’s a gem. And so is her soup. Coarsely chop mushrooms and lemon juice in a food processor. Melt butter in (4-5 quart) sauce pan and lightly sauté shallots on medium heat. Add mushrooms, thyme and bay leaf, sauté over moderate heat for 10-15 minutes, or until the liquid that is released from the mushrooms disappears. Add salt, pepper, cream and chicken stock and bring to boil. Reduce heat and simmer for 20 minutes. Add flour slurry and simmer for 10 minutes, stirring constantly. This soup recipe sounds wonderful! With the chilly weather up here in the Sierras, it would be a perfect meal. I love creamed based soups but I don’t make them as often as I’d like to. I’ll have to give this one a try. thanks for sharing. That sounds so yummy! I love mushrooms and soup! Looks very good! I will try it someday soon. I think it’s the turn in the weather. All I’m thinking about lately is soup. Uhhh, it doesn’t work that well–more of a texture thing not a taste thing. I love soups – especially to take to work for lunch. Keep posting them! This looks yummy and soooo simple. I’ve never heard of Wondra but I’m gonna check it out. Hi jane! Do you have a good potato soup recipe? I want to make a big batch of it before the baby is born…it feels like it would be nice to have on hand. http://bit.ly/17rvGH Look under My calendar under Featured Recipe of The Month. Enjoy! I kow the comment I’m responding too wasmadeafew years ago, but I felt it was important to mention this. You really shouldn’t freeze milk. Freezing causes undesirable changes in milk’s texture and appearance which can include splotchiness or graininess. Freezing milk does cause some degree of separation among its components. Skim and low-fat milk freeze (thaw, actually) better than whole milk, as there is less separation. You can shake the thawed milk vigorously or beat it in an electric mixer, but it still will not have the same “mouth feel” as milk that has not been frozen. Hi, can I use beef broth instead of chicken broth? Do you think this will change the flavor of the soup? Will the flavors work? Thanks for sharing the recipe!